She’s gonna get pissed when I write this, but oh well. Wifey Nadia has some weird hang-ups about her Mexican food. She hates enchiladas because of the red sauce and can’t stand fajitas because of the seasoning. Both dishes are delicious to me, so her disdain for them baffles me. It’s true; she does prefer green sauce to red, though she still seemed a bit skeptical about Week 30, Meal 1: Black bean and spinach enchiladas verde. When it came time to eat, she couldn’t stop telling me how good these were. And I agree. 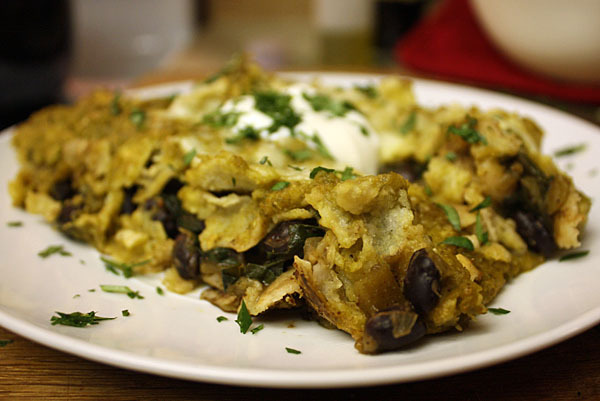 I’m a fan of black beans and cumin, and they work perfectly here. The smokiness of the cumin mingles with spice from ancho chile powder and a salsa packed with some sizzle from poblano and jalapeno peppers (and if you need more heat, add serranos or more jalapenos). I took one bite in the kitchen after taking the photo above and by the time I actually sat down at the table, I had already finished one enchilada. They look a mess in the pic, but I cracked those open to show you the delicious, meat-free goodies within. Follow the jump for the recipe and the step-by-step. It’s best to knock out all of your prep first, then roast the peppers while preparing the filling. Well break the post up into the two components, but do them however you want. I did all of my prep work first and then roasted the peppers while preparing the filling. By the time the filling was done, so were the peppers and it didn’t take long from there to bang out the rest of the dish. I doubled the recipe, so the pictures aren’t to scale, or whatever. Let’s cook. 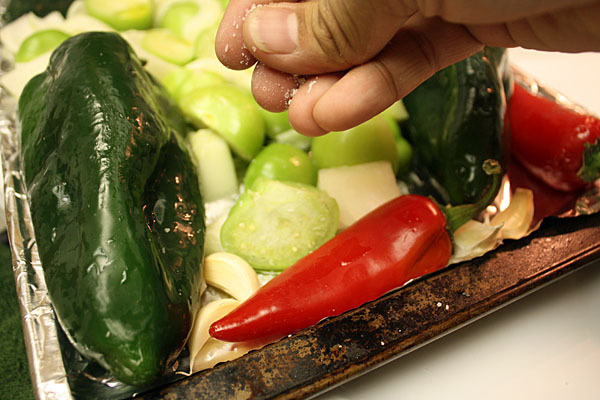 In a large bowl toss the onion, garlic, tomatillos, poblanos and jalapeno in the vegetable oil, salt, and pepper. Place in a baking dish and roast at 400 degrees for about 20 minutes, until the vegetables are very soft. 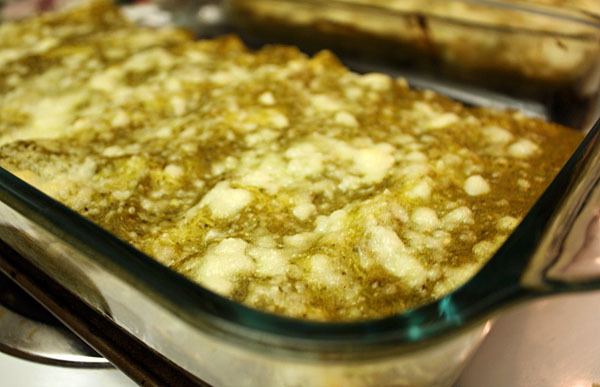 When you’re done with the oven, simply reduce the heat to 350 because the enchiladas will need to be baked later on. 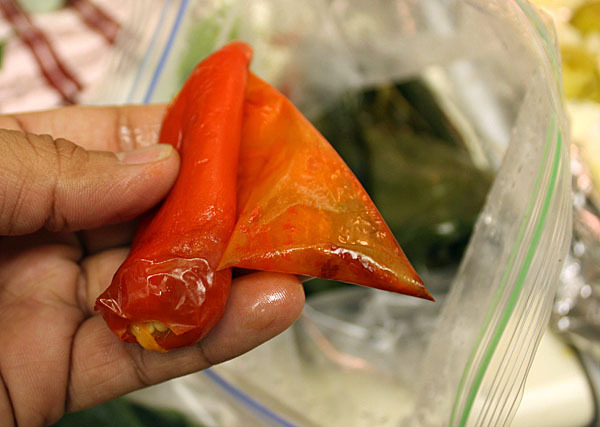 Put the peppers in a plastic bag and allow to steam for about 5 minutes. Peel the peppers. 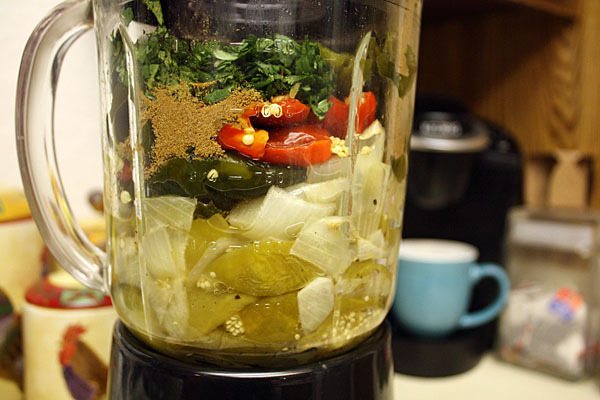 In a blender, blend together all veges until smooth along with the cumin and cilantro. Season, if needed, with salt and pepper. In a medium pot, heat vegetable oil over a medium high heat. Add onion and garlic and cook 2-3 minutes until the onions are soft. 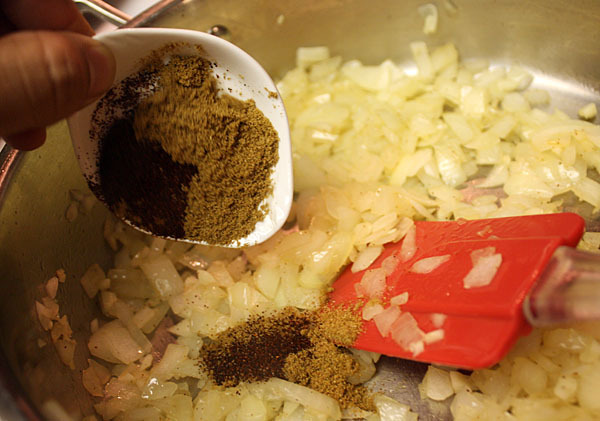 Add cumin and ancho chile powder. Cook for 30-45 seconds more. Next, add black beans and cook for another couple of minutes, stirring to coat beans with spices. 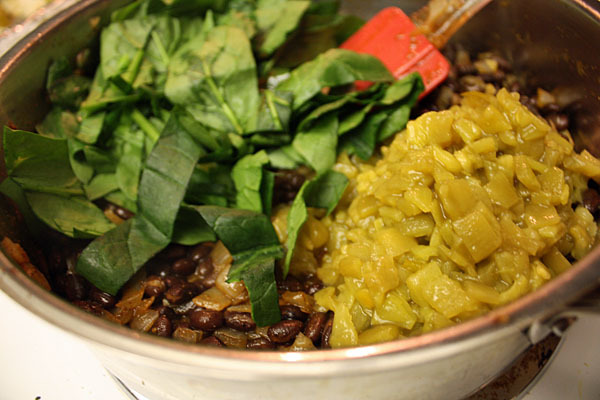 Add spinach and green chiles and cook until the spinach is wilted. Mix well with the beans. Season with salt and pepper as needed. And that’s the filling. Heat corn tortillas. Put 1/3 cup of filling into each and roll it up. Place seam side down in a baking pan. 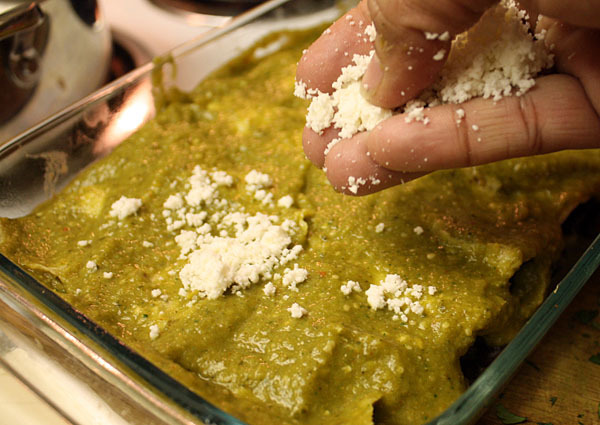 Cover the enchiladas in the enchilada verde sauce and sprinkle with 2 oz. of the queso fresco. Bake for about 20 minutes until the tortillas soften and the cheese is melted. To plate: Serve 2 enchiladas per person and sprinkle with remaining queso fresco, some cilantro and 1 T of sour cream each. 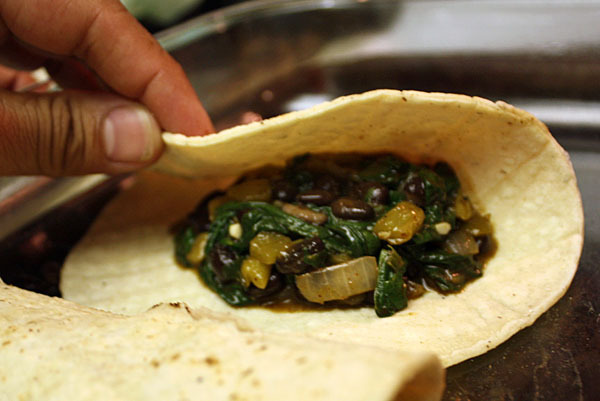 Mental note: black beans + cumin = awesomeness. I have bookmarked many of your recipes and I’m gonna try this one real soon. I really enjoyed visiting with you and your lovely wifey at Devin and Cat’s Wedding. I hope to get to visit with you both again, perhaps at DevoCat’s house. Til then, I’ll read your blog and try your recipes. Mr. DiNardo! Glad you like the blog! Hopefully we will run into each other again soon; that wedding was a lot of fun. If you make any of the recipes, let me know how they turn out.